Defense minister warns looming nuclear deal whitewashes Iran, will trigger nuclear arms race, ignores ICBM program and terror support. Ahead of an expected final deal on Iran's nuclear program on Monday, which Iran's top negotiator said may be delayed again until after Tuesday, Defense Minister Moshe Ya'alon (Likud) warned that Israel will have to "defend itself" after the deal. 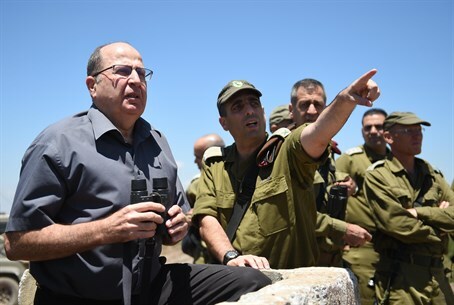 "The bottom line is that we're heading for a bad deal, after which we will continue to prepare to defend ourselves on our own power," Ya'alon said at the start of a Monday meeting of the Foreign Affairs and Defense Committee. "The deal being formed in Vienna will influence our political-security situation more than anything, and as far as we understand it will be signed soon, maybe even in the coming day. Even if there will be improvements at the last moment, this is a bad deal that allows Iran to be on the verge of the nuclear threshold, to be a nuclear threshold state with all that is implied by that." Ya'alon's statements came after a rare US briefing on the deal to Israeli officials Sunday morning, wherein US Under Secretary of State Wendy Sherman stated that both sides are aiming for a compromise on major issues by Monday. The defense minister warned that "the deal essentially whitewashes what Iran did, in opposition to the decisions of the (UN) Security Council." Speaking about the effects of the deal on the region, he said, "neighboring states are talking about the need to arm, which is liable to launch a nuclear arms race in the region. States like Saudi Arabia, Egypt and Turkey are talking about this." "And that's beyond the fact that the deal doesn't cause the closure of a single nuclear facility or the destruction of a single centrifuge." Ya'alon stated that there are two topics that "should concern not only us, but also all those who seek stability in the Middle East and the world." The first topic he noted is that Iran's ICBM (interballistic continental missile) program that is needed to deliver a nuclear strike is not being discussed in the talks, and secondly Iran's support for terrorism as the leading state sponsor of terror is not being raised either. The terror support targeting Israel includes "support for Hezbollah, funding Hamas and Islamic Jihad in the Gaza Strip, spreading the ability to produce rockets and the attempt to open a war front against us in the Golan Heights, as we saw at the beginning of the year," he said.